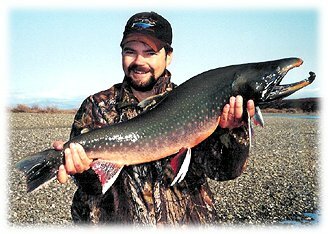 Northwestern Alaska's Trophy Arctic Char Fishing is Exceptional! Brian Steele has two things to brag about after his fall moose hunt in northwestern Alaska. The first is in this photo, the second is he released this fish immediately after this quick shot so that it would continue to contribute its exceptional genetics to the fall spawning gene pool. The fish was not weighed on a scale because of the desire to return it to the river with as little stress as possible. Brian and his hunting group took time off from their moose hunt in northwestern Alaska to fly out of Kotzebue with a local fishing guide who took them to the Wulik River in late September. Fall coincides with the spawning season for Arctic Char when the biggest fish are present. This char, based on its length of 34 1/2 inches and girth of 17 inches would peg the scales around 14 pounds which will qualify the fish for AOJ's Hall of Fame as a catch and released trophy fish. Congrats to Brian for his fine catch and its release.